Versatile and affordable. The permutations are left to your imagination. 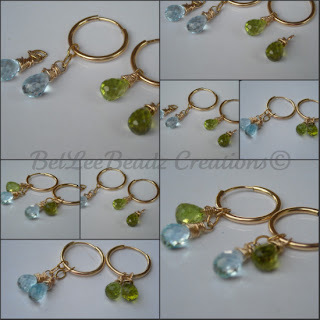 Use the 13 mm hoops on its own, use all 4 gemstones, just two, use a different color on each side... mind boggling.Gold filled ear hoops, wirework and faceted blue topaz and peridot briolettes measuring approx 7 mm each. I've added gold filled links on the blue topaz. Sure Rach. Send me an email.